This week, the Duke of Devonshire announced the death of his mother, Deborah, at the age of 94. 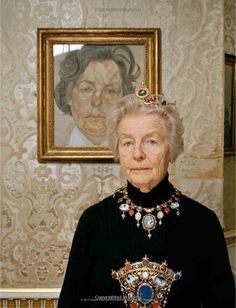 Born the youngest of the famous Mitford sisters, the Dowager Duchess of Devonshire was the chatelaine of Chatsworth House, one of the grandest estates in England, for more than half a century. As you can imagine, the job came with the opportunity to wear some impressive heirloom jewels. Here's a look at some of the jewelry worn by Debo during her lifetime. 1. Quoted in Diana Scarisbrick's Ancestral Jewels, p. 153.